Pollenia Rudis (Fabricus) or the cluster fly is approximately 8mm long and recognised by its abdominal patterns and dark grey/olive thorax with dense yellow matted hairs. 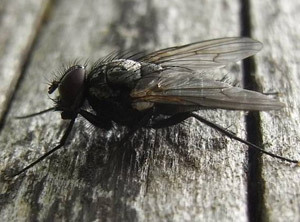 The adults are frequently mistaken for the housefly, although they are somewhat darker and larger and fold one wing over the other when at rest. They are also much more sluggish in their movements and fly much slower. Found mainly throughout Europe and the U.K. The common name refers to its habit of clustering and hibernating in numbers inside buildings. During the summer and early autumn, these flies are of no consequence. As the season cools, they seek shelter in nooks and crannies in buildings. As temperatures drop they search for more protection and frequently form vast clustering masses in roof spaces and lofts, with several thousand flies clustered together. It has often been observed that a single house or building in a row of similar buildings will be chosen year after year for this clustering phenomenon. Some large aggregations of flies do produce a rather sickly smell and, if warmed up accidentally or artificially during their hibernation, may emerge rather lazily and create some concern amongst the people using the building. This has occurred commonly in places such as church halls and domestic bedrooms. They are of no particular harm but are a nuisance because of their great numbers. . The adult female lays eggs loosely on and around damp soil, beneath dead and rotting leaves, etc. After about a week the larvae hatch from the eggs and actively seek earthworms to which they cling and then bore through the body wall. The conventionally shaped fly maggots develop inside the earthworm. Mature larval stages have been observed to push their hind ends back through the earthworm’s body wall to allow their breathing spiracles to gain access to the free air. At or near to the death of the earthworm, the larva bores its way out again and pupates in the soil. Since this a free-living ‘field’ insect, the life cycle is very dependent of weather conditions. In Britain it seems that two generations per year are common, but in hot summers up to four generations per year might be possible. Cluster flies can often most easily be removed with a vacuum cleaner. Aerosol fly killers deal with smaller numbers. Pest control contractors may use insecticidal fogs or smoke generators to clear heavy infestations. Unless dealt with properly they will return year after year. If you suspect you have a cluster fly infestation in Edinburgh, Glasgow, Aberdeen, Dundee or Perth, call GRAHAM pest control today and we could help.